This is an exquisite pair of Georgian silver sugar nips. 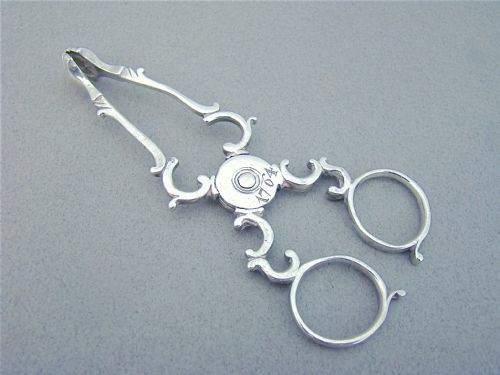 Scissor form “sugar nippers” were made between 1720 until around 1765 when they changed to the U shaped tongs. Shell cast bowls and dated central pivot. The reverse side engraved with initials. Length: 11cm / 4.5 inches. Scissor mechanism in full working order. Marks partially rubbed but identifiable. 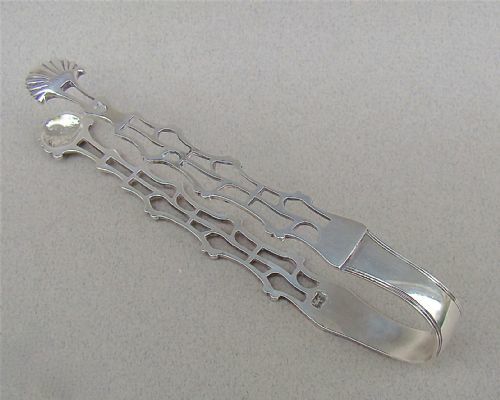 These cast silver tongs were made circa 1775 by John Bourne. Cast tongs are relatively rare , they only lasted a very short time, from about 1765 to 1780 and these are a fine example. They have an unusual design. Length: 13cm / 5.2 inches. Old repair to extremity of one of the arms, very well executed and not easy to spot. 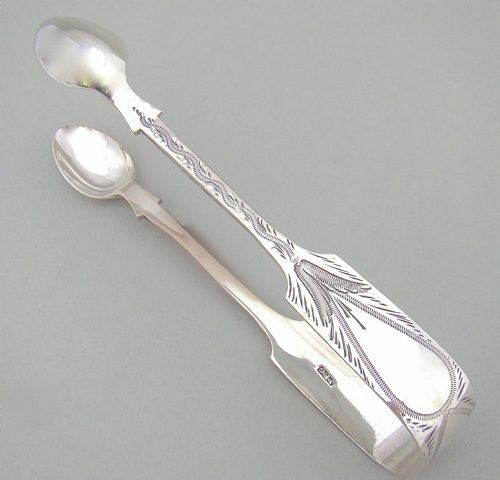 These solid silver Georgian sugar tongs are in wonderful crisp condition. Of straight form, they are bright-engraved with foliate motifs and have pretty elongated bowls. Vacant cartouche. These solid silver Georgian sugar tongs are in good crisp condition. Of straight form, they have bright-engraved borders and pretty elongated bowls. Vacant cartouche. Date letter "D" for 1799. Postage overseas: £7 Standard International. This is a rare pair of early Georgian silver sugar nips. 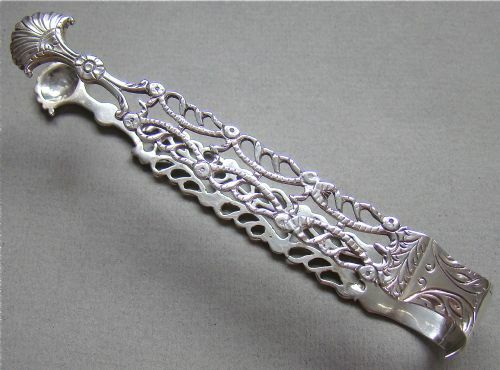 Scissor form “sugar nippers” were made between 1720 until around 1775 when they changed to the U shaped tongs. The bowls cast with scroll decorations. Length: 12cm / 5 inches. Marsk partially rubbed but identifiable. 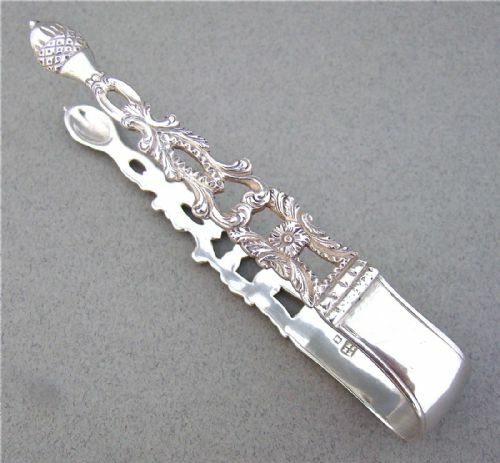 These elegant, spring loaded, pierced work, silver scissors sugar tongs date circa 1880 and bear both the French silver guarantee mark and the retailer's mark. Each shaped arms pierced with scrolls and terminating in a circular bowl decorated with an applied lozenge engraved with a flower head. The central circular spring mechanism prettily engraved with flowers and scrolls. Boar's head on one side or arm. Maker's mark on other side. Retailer's marks "Tournon" engraved on top of arm. Length: 9cm / 3.6 inches. Weight: 22.6 g / 0.8 oz. The tongs are working well. The spring mechanism is working perfectly. These cast silver tongs were made circa 1775 by John Phipps I. Cast tongs are relatively rare , they only lasted a very short time, from about 1765 to 1780 and these are a fine example. They have not been repaired, which is unusual, cast tongs are vulnerable and very often have signs of repairs. Length: 13.5cm / 5.4 inches. 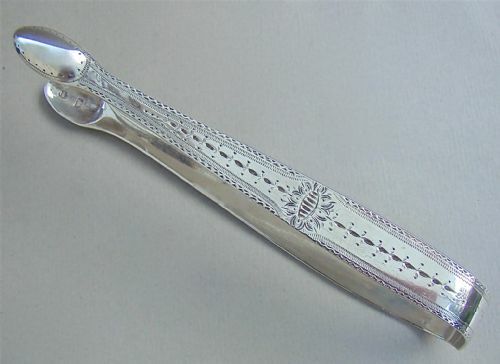 These cast silver tongs were made circa 1775 by William Collings. Cast tongs are relatively rare - they only lasted a very short time, from about 1765 to 1780 and these are a fine example. 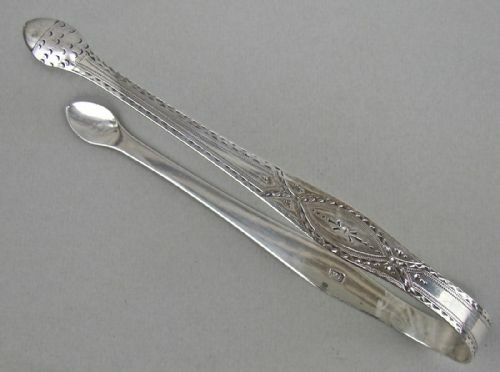 These solid silver Georgian sugar tongs are rare as they were assayed in Exeter. Of straight form, they are bright-engraved with foliate motifs and have pretty acorn shaped bowls. Vacant cartouche. 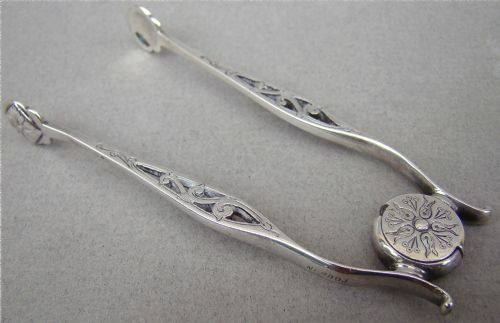 These solid silver Georgian sugar tongs were made by the highly collectable Hester Bateman. Of shaped form, they are bright-engraved with foliate motifs and have pretty acorn shaped bowls. Initialled cartouche. Length: 14.5cm / 6 inches. 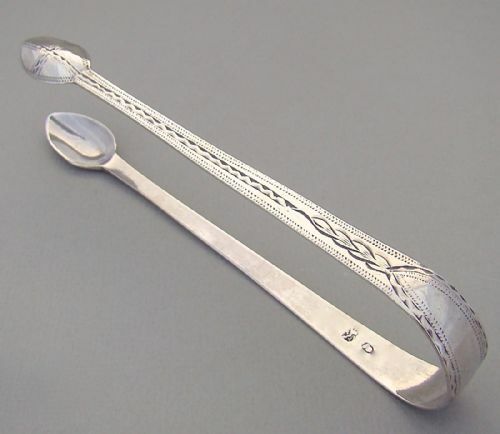 This is an interesting pair of Victorian solid silver sugar tongs made by a Channel island silversmith. 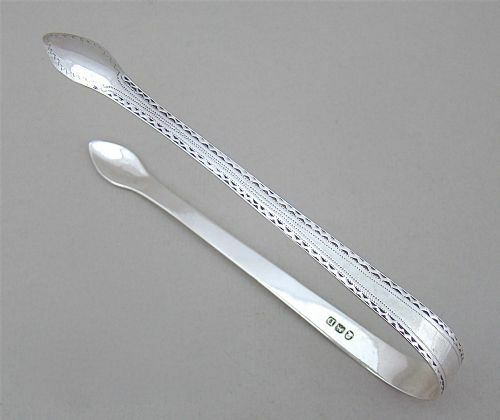 They are typical of Jersey silver flatware, a combination of Fiddle pattern and bright-engraving. John Pope Genge is a Jersey silversmith, Jersey silversmiths assayed their goods in Exeter, hence the Exeter town mark. They have a very good gauge of silver and feel satisfyingly heavy and are very pretty. J.P.G for John Pope Genge. Date letter "U" for 1876. Length: 14cm / 5.4 inches. 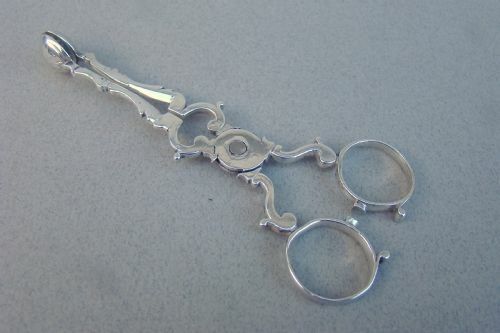 These unusual small Victorian silver cast sugar tongs were made by Elizabeth & John Eaton* . The mother and son duo produced pieces together for five years only, so their pieces are quite collectable. 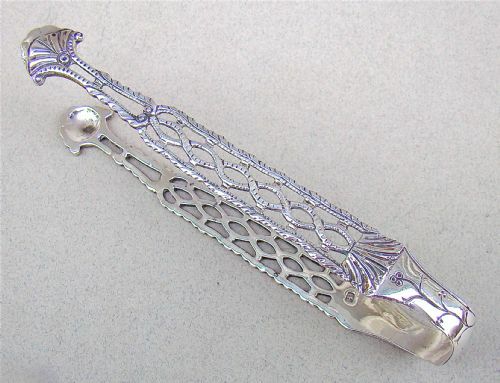 Originally, cast tongs were made from 1765 to 1780 and these are inspired from early Georgian examples. The workmanship is divine and the quality excellent. Elizabeth and John Eaton were mother and son. They worked together between 1858 and 1863. Elizabeth Eaton was a silversmith in her own right and the widow of William Eaton who died in 1845. She was a flatware specialist and traded under her own name from 1845 to 1863. The firm was acquired acquired by Henry Holland & Sons in 1864. EE over JE for Elizabeth and John Eaton. Date letter "e" for 1860. Length: 9.5cm / 3.4 inches.